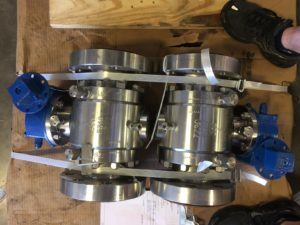 You may find Double Block and Bleed valves in many types of industries, including; Gas and Liquid pipelines, Production, Processing Oil and Gas, and more. This feature ensures zero leakage which is why they are popular in pipelines. For any questions regarding our Double Block and Bleed Valves, be sure to reach out to one of team members. This entry was posted in API 6D Valves, Ball Valves, Double block and bleed valves, Downstream Oil and Gas, Engineers, Gas production, High Pressure Ball Valves, Midstream Oil and Gas, Oil and Gas production, Pipeline Ball Valves, Pipeline Valves, Thru conduit Gate Valves, Trunnion mounted ball valves and tagged Api 607, Blowout Proof Stem Design, Double block and bleed valves, Double Body Sealing, Full Port Valves, Live loaded Packing, Reduced Port Ball Valves on July 27, 2018 by gvcadmin. What makes GVCINTl the preferred Valve Manufacturer?